South African skipper Graeme Smith was a relieved man after his side hung on to clinch a dramatic one-wicket win over Sri Lanka in a nail-biting match. Lasith Malinga took four wickets in four balls to reduce Smith's side from 206-5 to 208-9 before Robin Peterson edged the four that saw them home. 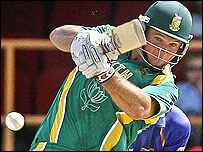 Smith said: "I definitely aged from 26 to 40 years old in the last few overs. "I'm really pleased that we dominated 95% of the match, but that spell from Malinga put us under real pressure." Set 210 to win after bowling Sri Lanka out for 209, the Proteas looked to be cruising as Jacques Kallis scored 86 to build on Smith's 59. But with five overs to go and four runs needed, Malinga produced a hat-trick - and then clean-bowled Makhaya Ntini to become the first man in World Cup history to take four wickets in four balls. Smith said: "Sri Lanka in these conditions were always going to make it a tough game, and we knew we would have to grind out the win. "I'm chuffed that we've put them behind us and put those two points on the board. "The surface suited them, so to dominate 95% of the game was incredible." Smith also paid tribute to Charl Langeveldt, who took five wickets in two key spells for South Africa. He said: "Charl's been bowling well for a while now. "Not only did he get the ball to swing, but he took wickets at the death and then blocked out 10 balls at the end of our innings too."